Ho ho ho! The holiday season is in full swing and kitchens everywhere will soon be cooking up holiday hams, Swedish meatballs or a range of other traditional dishes that have been passed down from generation to generation as families will be gathering at the dinner table throughout the world. Many of us take this time to connect with extended family, friends, old neighbors, past coworkers and others who've been a special part of our lives. 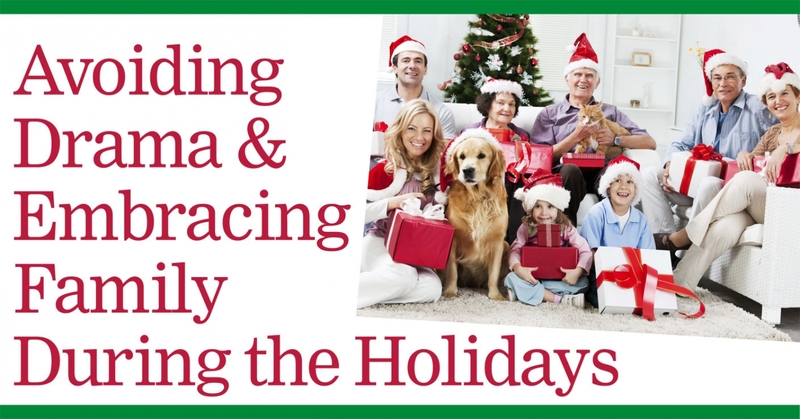 Family gatherings are a meaningful way to celebrate the season but they don't always go as planned due to various family dynamics. Whether someone brings up politics and an argument ensues or the dueling culinary aunts are at it again, get-togethers can be hard. Fortunately, we have some tips for bringing family and friends together for a festive, drama free holiday celebration. Yes, holiday gatherings can sometimes be stressful, but be thankful for people in your life that want to spend their holiday with you and know it usually only lasts a day or two. If at all possible, try and resolve any outstanding issues from previous years. Call, text or write with the intention of smoothing out any misunderstandings ahead of time. Invite a couple of neighbors and friends without family nearby to the gathering, as they'll add a different dimension to the party and may have a new perspective on your family. Who gets along well and who doesn't? Who's most likely to start a conflict or drink too much? This is a cautionary warning to think through the seating arrangement carefully and put those most likely to get on well together. There's a reason people like to hang out in the kitchen during parties, it's where the action is! Get everyone, even the kids, involved in the food prep, serving and clean-up. Helping out really does bring people together and keeps them busy. A fun card game or board game involving several people like Pictionary is always a welcome reprieve. Set up an area for the kids to play and include games and toys for them to play with and keep them entertained. Whether you choose a group walk around the neighborhood, a friendly game of touch football or a little Christmas caroling, getting people out of the house and taking in some fresh air always lightens the mood. If you have more time, head out for some cross country skiing, snow shoeing or ice skating. It's fun for young and old! For family members that will be around for more than just the holiday itself, make some fun plans together or apart. There's no rule that says you need to spend every second together. Some may want to go sale shopping, others might want to catch the holiday football games on TV, while one or two may want to get in a yoga session at the local gym. A little time apart from the whole group may ease any building tensions. You can't change anyone's behavior or opinion but you can be a role model and show respect for everyone's opinion. Just kindly ask everyone to please not bring up certain taboo topics at the dinner table such as religion and politics. It will help keep them on their best behavior. Sometimes you just have to agree to disagree too. Keep in mind that everyone has some level of family drama and a few crazy relatives. Just tell yourself "It is what it is!" If your family is really big or you just want a neutral space and plenty of room for your holiday, consider renting a space for your family. Everyone can chip in a bit so it keeps the cost low. Finding a neutral space can also help resolve conflicts. Think about hiring a caterer or making it a potluck so all is fair in love and family holidays.